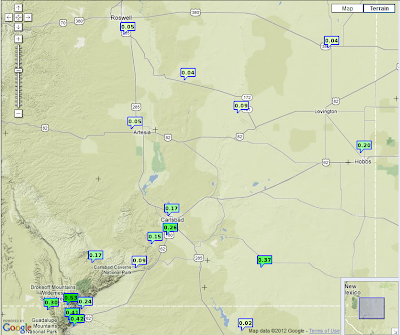 A Dense Fog Advisory remains in effect for Eddy and Lea Counties until 7 AM MST this morning. 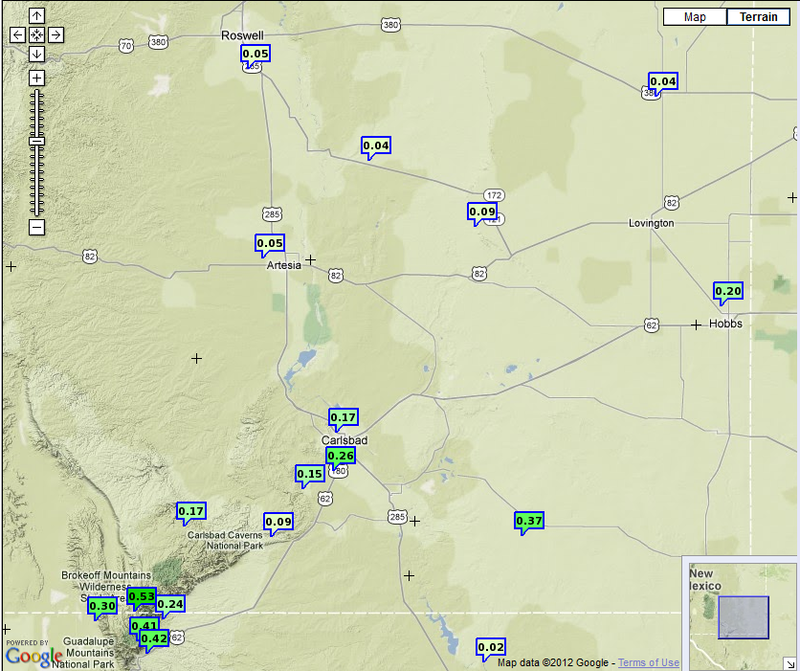 Visibilities in some locations will drop down to less than one quarter of a mile. Our skies will clear later this morning as the morning sun burn the fog off. Our afternoon highs are forecast to climb up into the low to mid 70's. 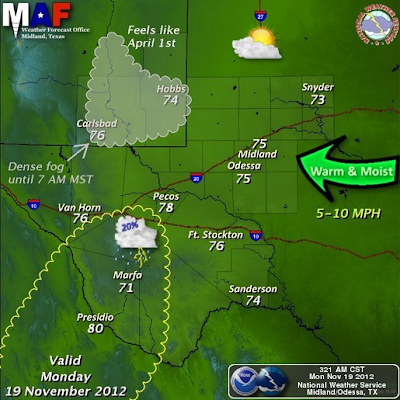 Tuesday will see highs in the low 70's. Clouds will be on the increase Tuesday night into Wednesday ahead of another weak upper-level trough of low pressure approaching from the west. We will have another shot at seeing some light rain showers Wednesday afternoon. Our afternoon highs on Wednesday will be a little cooler with readings in the 60's expected. 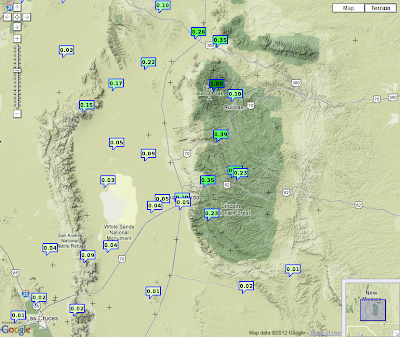 24-Hour Rainfall Totals As Of 5 AM MST. 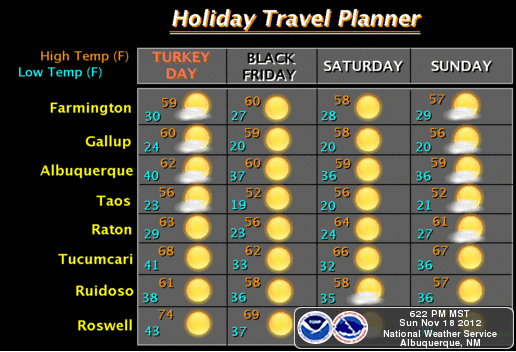 Thanksgiving should see clearing skies, and balmy temps with afternoon highs in the low to mid 70's. 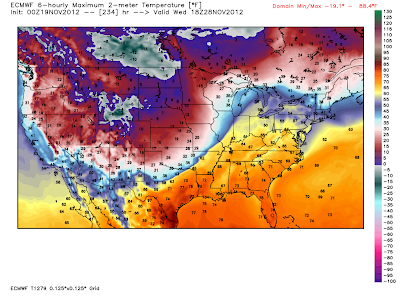 Friday will be a little cooler with highs in the low to mid 60's. Invasion From The Arctic In A Week? ECMWF/GFS 8-10 Day 500 MB Mean Heights. 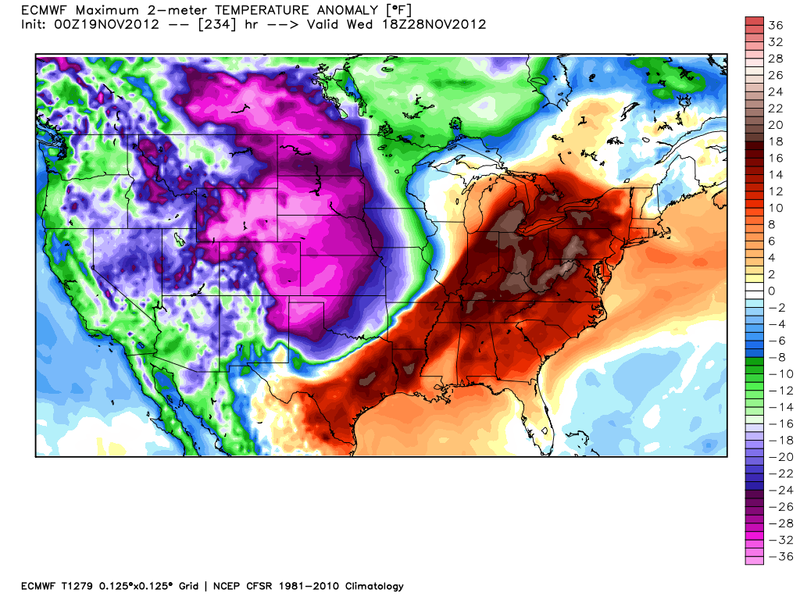 00Z/5 PM MST ECMWF Temp Forecast. 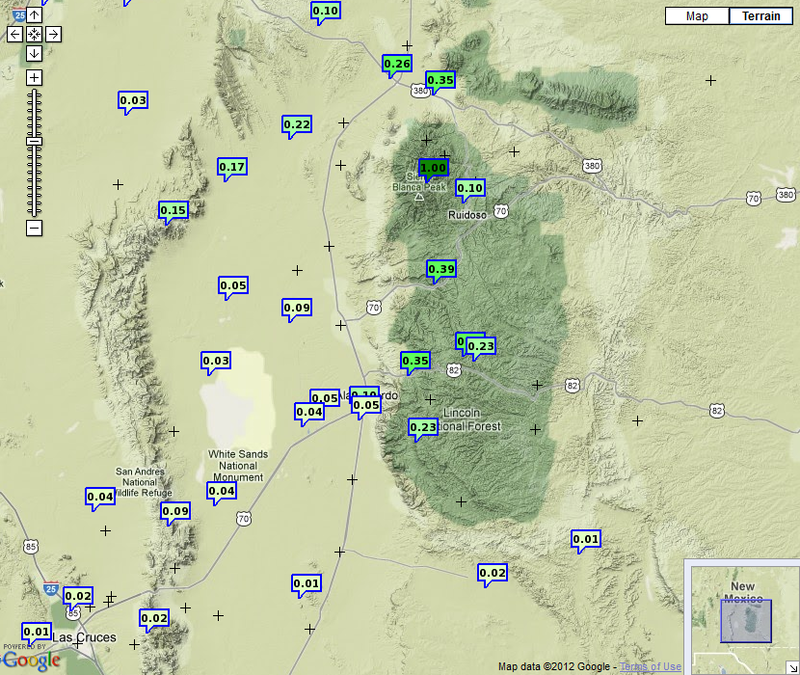 Valid At 5 AM MST Wednesday Nov 28, 2012. 00Z/5 PM MST ECMWF Temp Anomaly Forecast. 00Z/ 5 PM MST ECMWF Temp Forecast. 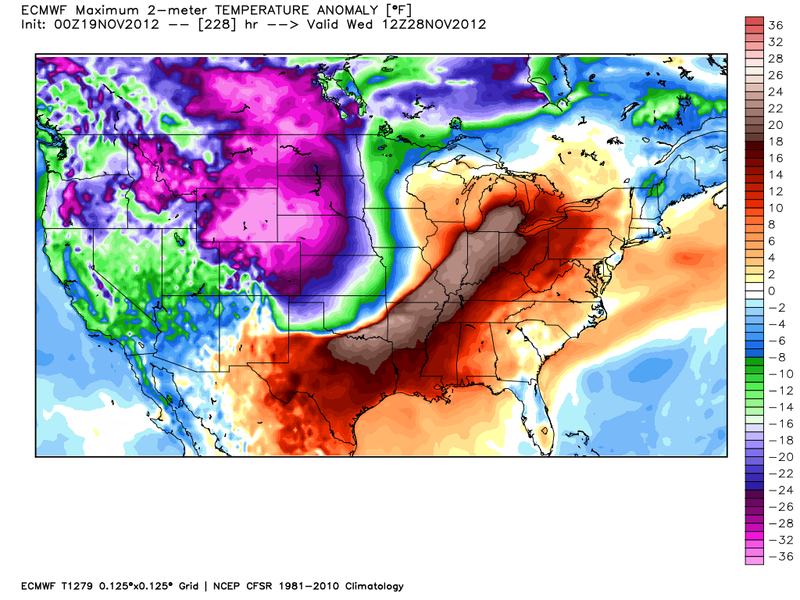 Valid At 11 AM MST Wednesday Nov 28, 2012. 00Z/ 5 PM MST ECMWF Temp Anomaly Forecast. 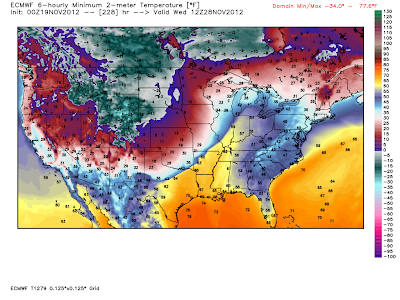 Last nights 00Z/5 PM MST run of the European (ECMWF) forecast model continues its trend of forecasting some brutally cold arctic air to invade the country in about a week. 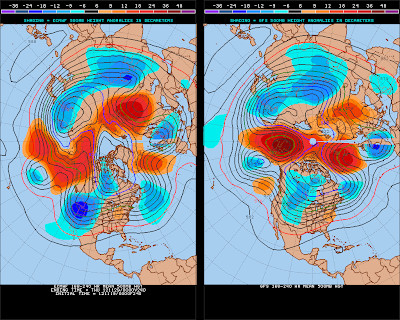 The U.S. GFS model is flip flopping all over the place with its forecast on this invasion from the north pole. 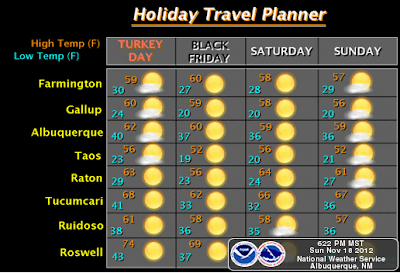 Enjoy the 70-degree temps this week because they are going away soon!